With these preparations in place, I asked if I could tag along with a NASA group here working on Operation IceBridge, an airborne mapping and measurement program intended to bridge the gap between the ICESat satellite (a laser-ranging mission that measured the elevation and height changes of the polar caps from 2003-2009) and the upcoming ICESat-2 mission, planned for launch in 2016. The primary aircraft is a specially modified DC-8 airliner, packed with instruments, consoles, computer screens, and quite a few nice business class seats for the instrument team and visitors. To me, the interior looks a bit like a Russian space station – part high-tech, part military, part baling wire. A weather briefing the evening before showed that much of the north coast of West Antarctica would be clear, and in the morning the IceBridge project team leader, Michael Studinger of NASA Goddard, picked the Getz Ice Shelf as the day’s target. 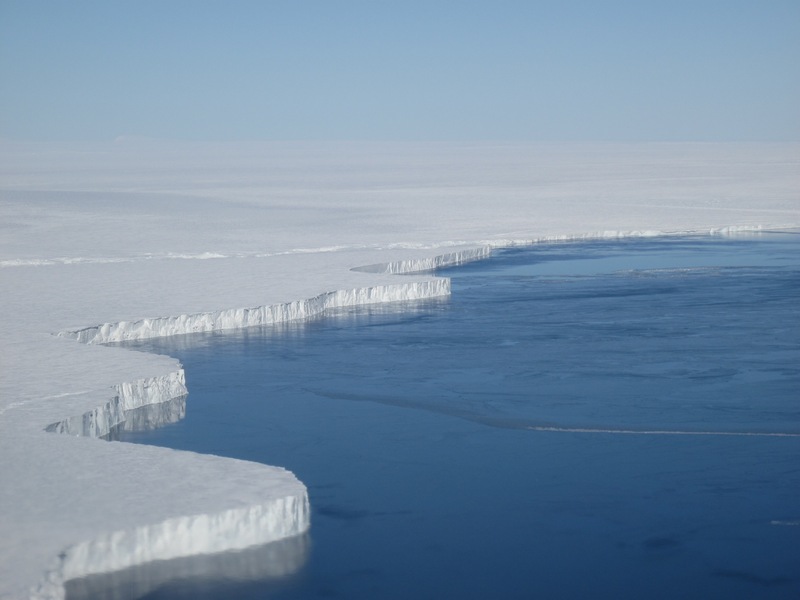 The Getz Ice Shelf is an interesting, relatively unstudied area of West Antarctica that has recently shown some major changes, similar to the changes occurring in the Antarctic Peninsula. But unlike the Peninsula, instead of major air warming leading to surface melt and shelf break-up, the Getz area appears to be responding to warm ocean currents. These currents are brushing along and under the bottom of the ice shelf, and the effect is a bit like aiming a hot water hose against the lower edge of an ice block. The ice on the underside of the shelf, especially just where it begins to come afloat, melts back. This loosens ice from the bedrock, allowing the glacial ice inland to increase in speed and the surface to lower. The plane took off at precisely 9:00 am. That is NASA for you: really amazing precision, and really bad coffee. The kitchen in the back of the plane looks like something from a derelict meth lab, and the coffee that comes out of it (you make it yourself, but it’s all pre-packaged) looks a bit like compost tea. The similarities don’t end there. Off over the southern deep blue we sailed, four large turbofan engines pulling us along nicely for several hours (the DC-8 can operate for more than 12 hours straight). The flight took us over some of the wildest ocean areas on Earth, and they were white-capped and choppy-looking today, even from our cruise altitude of 37,000 feet. We reached the Antarctic coastline around 1pm, and the plane dropped lower to make a measurement run. As we did, the plane passed in front of the gigantic Pine Island Glacier, the largest glacier on Earth by annual flux, and worryingly out of balance. By itself, this glacier is responsible for about 10% of the Earth’s total sea level rise, and it has accelerated significantly over the past forty years. I wanted a look at this criminal of global change, but I must say that an airliner window simply cannot encompass it. It spanned a good quarter of the horizon from our vantage point, bluish and hazy in the distance, and so subtle and broad that you had to be told where it was by a map. The Getz Ice Shelf was more tractable for the human eye: mountains, crevasses, ice waves, horizontal curtains of blowing snow racing out into the ocean, and ice cliffs perhaps fifteen stories tall stretching for miles. Getz is like a fringe, a lacey ruffle, spanning 500 miles of coastline, with dome-like ice islands poking through it, and a textured surface a bit like well-used sandpaper. The plane flew lower now, seeming to skim the surface, but in fact we were a comfortable 5000 feet above the snow. We crossed just above the coastline and then turned and flew out over the floating ice downstream of the coast, with one hard right to explore a large glacier and then back. Getz has recently followed the pattern of the much larger Pine Island Glacier, beginning to rapidly lose elevation and mass. The current theory behind this mass loss is that a change in wind patterns related to climate change has led to a warm deep layer of ocean water periodically sloshing onto the continental shelf. For the Pine Island area, this process seems to have begun as far back as the 1980s, but for Getz the changes began just in the past ten years. The warmer water has always been out there offshore, around 2000 feet below the ocean surface, but by the gentle persisting wind changes spanning decades, it has been coaxed up to 600 or 700 feet at the edge of the Antarctic continental shelf, spilling over it. From there, it tends to hug the sea bottom and reach in to the deep underside of the glaciers at the coast, melting them at the point where they emerge from the main ice sheet and begin to float. What we saw in the radar systems on our flight was that the Getz is quite thick (up to 1500 feet) and its deeper ice would sit squarely in this new warmer water. This has led to rapid thinning and acceleration. 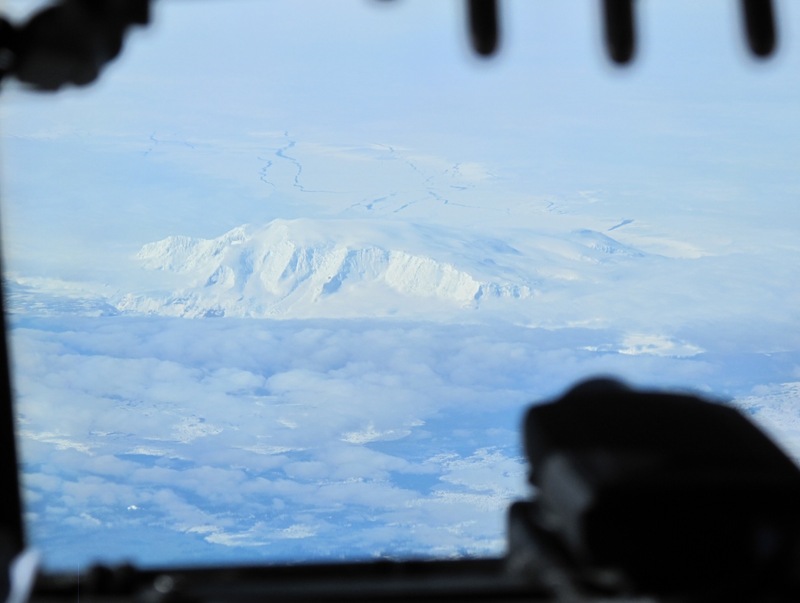 With the main mission behind us, the plane climbed back to altitude and headed northward. Looking at the flight plan I noticed we would be flying almost directly over an island, Peter I Island, a lonely icebound mountain just a few miles across in the middle of the Antarctic ocean, rarely visited. What a cool opportunity! All this instrumentation headed right for a bona fide piece of the unknown. I went over to John Sonnetag, the science lead for the flight, and asked if we could keep the sensors on for a few extra minutes. The teams all obliged. The pilots even nudged the great bird a mile or so sideways to more squarely cross the island. I watched on the high-resolution web-cam on board, aimed directly below. Ocean and ice passed beneath, then a small iceberg, and then a rugged ice cliff and mountain ridge. In perhaps ten seconds, it was over, and we were back to crossing our thousands of miles of southern ocean. 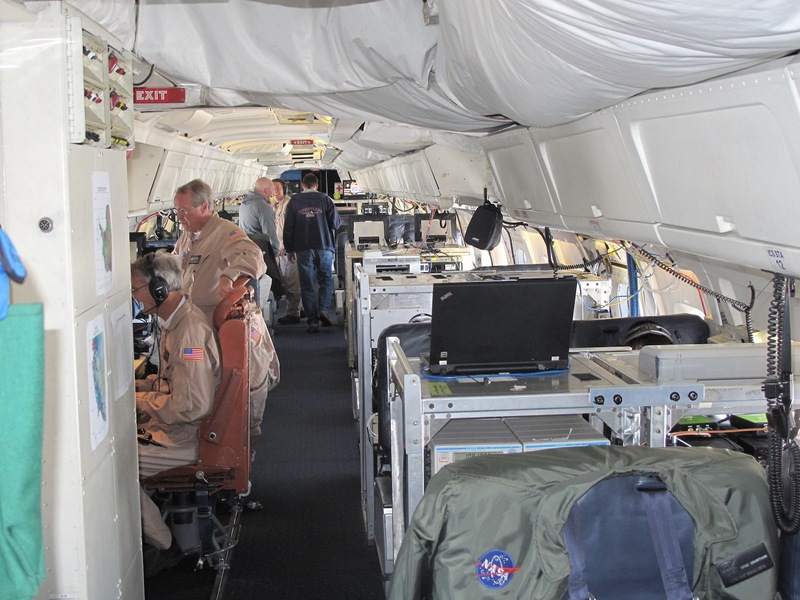 I checked with the teams – every instrument worked perfectly for the whole flight. Unless you count the coffee maker. The IceBridge team also flew over Peter I Island, a relatively unstudied island off the Antarctic coast. Photograph courtesy Ted Scambos. Researchers record data on the NASA DC-8 during a flight of the NASA IceBridge program. Photograph courtesy Ted Scambos.